Live, enjoy, relax! The Adventure is Here! Round trip Transportation in Luxury Bus / Van from the lobby of your Hotel. Ticket of CHICHEN ITZA entrance. 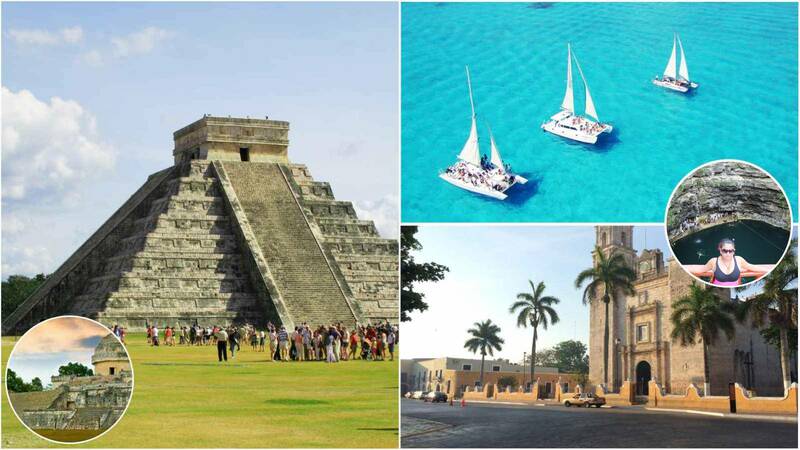 Tour inside Chichen Itzá with guide certified by SECTUR México. Party and contests back to Cancun. Transportation Maritime Cancun - Isla Mujeres - Cancun. Breakfast (sweet bread, coffee and juice). Our Beach Club has a shower service, lounge chairs and umbrellas. Games and activities on the best beach in Isla Mujeres. Historical walk in the center of Isla Mujeres. Drinks during the tour and the food. Additional food to the Buffet Meal. Tax for the use of Professional Video Cameras / Go Pro inside Chichen Itzá. Price does not include Dock Law, Federal Tax: $ 5 USD per person. Snorkel (optional, it is paid at the time of registration: $ 14 USD). Golf Cart (optional, it is reserved upon arrival at Isla Mujeres: $ 14 USD). Transfer from your Hotel to the Marina. Drinks at the Beach Club. Photos, Video and Tips for the Staff. Reserve at least 7 days in advance. $ 77.00 Juniors 3 - 9 Years.